As smooth as silk. A mature car. 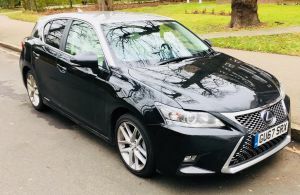 Sad to say that whilst a Lexus CT 200h has been the family car for the past three years I have never got around to producing a road test of it writes Malcolm Ginsberg. It may not have been the most inspiring automobile to own but it has got on with its job quietly and efficiently. In the meantime BTN has reported on its bigger brother, the IS 300h SE (see BTN 13 October 2014) and earlier models too. Our experience of the CT 200h has been of a slick small five-seater, leisurely rather than quick, with a quality cabin. The road test car’s two tone silver and black bodywork is very smart and it also came with an electric sunroof. Perhaps we were expecting too much but while the 2018 Lexus CT 200h is a fine car we are not going to change our 15,000mi earlier version for this model. The test vehicle was the Luxury, one up from the standard SE, with a Premier above and a so-called F Sport topping the range. Lexus hybrids are engineered to run on the power from their petrol engine and electric motor. But they can also pass the time of day in heavy town traffic on their electric engine alone. From experience expect 45mpg. 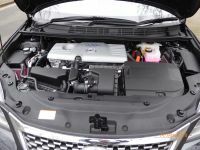 The CT 200h is powered by the same 1.8-litre VVT-i four-cylinder petrol engine (Toyota's 2ZR-FXE) as used in the Auris and Prius, producing 73kW (98hp) and 142Nm (105lbf⋅ft) of torque, paired with electric motor/generators in the hybrid drive system; together the engine and electric motors produce up to 100kW (134hp) and 207Nm (153lbf⋅ft) of torque along with an electronically controlled continuously variable transmission. What this means from a practical point of view is a car that is silent in town, and if you are stuck in slow traffic the petrol consumption improves and can reach an astonishing 76 miles per gallon. In that mode it is environmentally perfect. In any event the 200h suffers no road tax. As well as the full hybrid powertrain’s Normal drive mode, three on-demand drive modes – EV, Eco and Sport – can be selected, adapting the vehicle’s performance to suit the driver’s mood or the road conditions. From start-up and at speeds below 28mph, the CT 200h will automatically operate in EV mode for short distances when conditions permit, running solely on its electric motor. In Eco, throttle response to aggressive use of the accelerator is reduced and control of the (standard) automatic air conditioning is adjusted to achieve better fuel economy. The Sport mode is tuned to deliver more power from the electric motor to make the most of the CT 200h’s performance and agility. The panel illumination, mode select switch and a central spotlight in the instrument cluster automatically change from blue to red when Sport is selected, and the Hybrid System Indicator changes function to become a tachometer. The little Hybrid is not the quickest about but with nought to 62mph in 10.3 seconds and a maximum speed of 112mph she can hold her own and cruise effortlessly at the legal motorway limit. Almost seven years on from its launch, the smallest of the Lexus range is an updated car with the obvious latest front-end styling from the marque. The rest of the changes are minimal except for the 10.3” satellite navigation screen, which includes a reversing camera. In our own car the traditional rear-view mirror ingeniously was used for this task but in practice it is too small. Sad to say the exterior passenger safety mirrors, controlled from a switch in the door do not fold back electrically on the Luxury model. You have to physically undertake this task on this latest car too. With the Premier version it goes all electric, auto-folding, and coupled to the keyless entry system. The cabin continues to express Lexus quality and craftsmanship with its use of fine trim and upholstery materials, rich surface textures and a “form-follows-function” styling philosophy. Another welcome addition to the updated model is the availability of the Lexus Safety System+ (standard on all UK grades above SE) that offers enhanced safety with advanced technologies such as a Pre-Collision System (PCS), Adaptive Cruise Control, Lane Keeping Assist Alert (LKA) with Sway Warning, Automatic High Beam (AHB) headlights, and Road Sign Assist (RSA). Climate control is automatic. It might be all acronyms but what it means in real life is you can set it on cruise control with the car automatically slowing down if near to the vehicle ahead and bleeping if you creep out of the lane. Speed limits shout out too. On the revised CT 200h, Automatic High Beam improves the driver’s night-time visibility by automatically switching the headlights to low beam when the lights of oncoming traffic or vehicles ahead are detected. This means the headlights high beam is used for the maximum amount of time, but with no risk of dazzling other motorists. The 2018 CT 200h Luxury tested has a host of minor improvements with the daytime lights repositioned so to sit above the single-projector bi-LED headlights, creating a continuity of styling with the character lines that flow down each side of the car. The fog lights, located at the further edges of the front bumper, have gained a new metallic grey finish to their bezels and distinctive, sharp-edged, triangular frames. There are changes at the rear, too, with new Lexus L-shaped taillights that create a wider, sportier look. The lights are now all-LED units, with the turn indicators moved to the lower edge of the unit, strengthening the overall L-motif. In effect the car has been tidied up and the test car, compared here with the family saloon, really does look smart. The cabin is very tidy with the leather interior. The test car came with a number of useful accessories including a fine ten-speaker Panasonic system. Heated front seats are standard. The latest minor and discreet changes maintain its status as one of the best interiors in its class. You feel snug and the front seat passenger languishes very comfortably. Three can sit at the back and in the rear of the front seats are storage pouches large enough for newspapers and other items. The tail gate is not powered and the rear floor area sits a comfortable 70mm off the road, and is 100m x 84mm, with a 188mm extension if you put the seats down. Under the floor there is more space. I started out by saying that we are staying with our present Lexus CT200h. This new upgraded model is a fine small luxury car and gives no tantrums on the road. It is steady in the wet, has neat handling, and a reasonable turning circle. The problem is that the improvements to the new model are not enough to encourage us to change our low mileage Lexus. If we were starting from new we would go for one.